A reader has already alerted us to the Sarah Palin-Shakespeare connection. But did you know that Sarah Palin’s book Going Rogue is Shakespearean? You didn’t??! Well, read on! 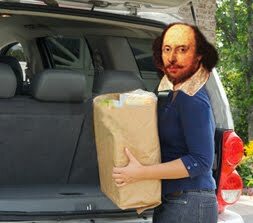 In an op-ed entitled "Sarah Palin and the Bard" published a couple of weeks ago in the conservative journal American Thinker, Joseph Hatch compares the “liberal elite” who snub Sarah Palin and her “Middle America” book tour groupies to the upper-class writer Ben Jonson who had snobby thoughts about Shakespeare and his working-class fans. Apparently, Jonson would look down from his luxury box at Shakespeare’s plays and nearly vomit at the sight of the shoving, jeering, and generally bad-mannered commoners—the “groundlings” who occupied the cheap spots near the stage. "I am not attempting to compare Governor Palin's literary skills to those of William Shakespeare, but she has grasped one of his most important tenets: "Brevity is the soul of wit." Succinct messaging; a crisp, clear delivery; and an occasional swordfight for good measure may pack the seats, but it takes a connective truth -- a "moral to the story" bubbling underneath the spectacle -- to keep fans in their seats and coming back for more." Brevity, right. As in, brief stint as governor? I'm not exactly sure what Hatch means when he says that people "keep coming back for more" of the "connective truths" that lie underneath her lurid spectacles. Maybe if I take another look at Levi's spread in Playgirl I'll figure it out. Point taken, Hatch: I do just keep coming back for more. The vacuous bloviating in that op-ed reminds me uncomfortably of the conversations overheard last weekend at the Globe Theatre's touring production of Love's Labour's Lost, in Holyoke MA. "Go to the Globe! It's all Standing Room Only! Shakespeare was really a popular entertainer, you know! He was really writing for the groundlings, you know!" This apparently justified a shamelessly broad LLL that was much more like a Benny Hill episode than anything I've seen since Benny went off the air. Pandering to the provinces...but unfortunately, the provinces seemed to be eating it up! See, I just took your mind of Sarah Palin! Oy, my blood pressure. It's people like Joseph Hatch who are responsible for the phrase "American Thinker" becoming an oxymoron to much of the world. I especially like his use of a quotation from a notorious windbag to illustrate that it takes "succinct messaging [and] a crisp, clear delivery and a "moral to the story...to keep fans in their seats and coming back for more." To quote that other famous wit, Foghorn Leghorn: "I say, I say, that's a joke, son!" Since when was Jonson "upper class"? Did Hatch's fact checkers forgot to turn down Fox News long enough to note that Jonson was, despite his impressive education, the son of a brick layer?